Guys, Garret Dillahunt looked hot this episode. Like, I understand that he kind of went through a makeover a couple of episodes ago, but for some reason he really did it for me this episode in his wifebeater. Rolling around in the bed while his girlfriend played with the air conditioning, just waving those guns around like nobody's business. It's weird because he looks so very old, but he is only 51 (where Chris Messina is 41, which isn't like a crazy difference). And even still, even with the beard and everything, I would have to confess that I think that Garret Dillahunt is more attractive. I was kind of leaning that way, but then this episode with the aforementioned wifebeater and I think then it's pretty much guaranteed that I find that man handsome. Geez oh man, The Mindy Project loves itself a good, handsome white dude, huh? Oh, I'm sorry. I'm not talking about the episode — just talking about that beefcake Garret Dillahunt. "Anne," you say (or groan now because we've met like this before). "Can you at least try to review the episode?" It was fine. 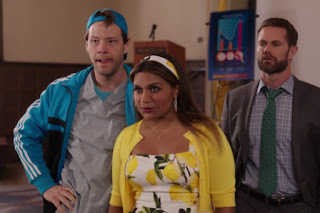 I imagine that people who binge-watch this show must like it an awful lot: the jokes wash over me in a not laugh-out-loud but certainly not unfunny way, Mindy's outfits are awesome, and Garret Dillahunt is fine, fine, fine. A.V. Club writer and The Mindy Project reviewer Gwen Inhat summarizes it best when she says that, "instead of a solid progression, the viewer feels not unlike a pinball, being knocked around from week to week." As a viewer, it's sort of frustrating. (I imagine for Danny and Mindy shippers, it's very frustrating.) As a reviewer, though, this sort of wild oscillation between character development and jokes is more than just being a pinball — it's someone flipping the machine on its side and demanding it still be played. I mean, a game's a game, but you're not gonna win that one. What's the point? "What's the point?" has been the theme of a lot of my reviews, whether I say it in a hopeful or a pessimistic way. "What's the point?" on one hand could mean that The Mindy Project, with its remaining four episodes, has a lot of cool directions it could go. "What's the point?" could also mean that The Mindy Project could try to go all directions at once, skimming the surface of what it has, in the past, been able to do. Oh! Wait, guys. I think I;ve got it. I think I understand now! I just talked to the ultimate deity and was offered a choice. She* gave me the opportunity to understand the meaning of this crazy game called life, but I thought that understanding the point of The Mindy Project would be a little harder to do on my own. Grand mystic! Omniscient overseer! What, oh what, is the meaning of this charming once-FOX comedy that, in my opinion, has gone wildly off the tracks since its peak? Oh, right, yes, of course. He's really hot in the wifebeater. It all makes sense now. Thank you, ultimate deity. Thank you, The Mindy Project! I'm not kidding about Garret Dillahunt, but the Princeton Charming was also pretty smokin'. As you probably know, Chris Messina will not be returning as a series regular in season five. As it stands, only Mindy Kaling has been in every episode, which seems about right. However, as I peruse IMDB, I discover that it's official: Ike Barinholtz has been in more episodes than Chris Messina. RIP, Mindy and Danny. Interestingly enough, IMDB seems to like season four fine; 5/10 of The Mindy Project's top-rated episodes are from the season, and I actually pretty much agree with the assessment. Only one season three episode up there ("We're a Couple Now, Haters" which I also agree with) and no season one episodes up there. I kind of get it — the first season had some really bad B-plots. But man, no "Santa Fe" or "My Cool Christian Boyfriend" love?! I am wild about the lemon dress. I have a lemon skirt that I bought two-and-a-half years ago, in the peak of my Mindy love, and I have yet to stop loving it. I read some criticism of the episode that said the tone was off because of the writer, to which I say: dude, there is no consistent tone to this show! Tsk, tsk.